Not so long ago the image of Bradford was one of blackened buildings shrouded in the smoke of countless mill chimneys, and this view may persist with those unfamiliar with the present-day smokeless city. Bradford was the archetypal 'coaltown', the product of 19th century industrialisation. That it was built on coal is true both in the literal and the metaphorical sense. Its rich, accessible and varied deposits of coal, iron ore, and other useful minerals were the main sources of its phenomenal growth in the last century. However, by 1840 the town had acquired an unflattering reputation as one of the smokiest places in Britain. It took almost 130 years to clean up its atmosphere, during which time the inhabitants paid a high price in pulmonary deaths and environmental squalor. Air pollution and deaths from respiratory diseases, excluding pthisis in Bradford. 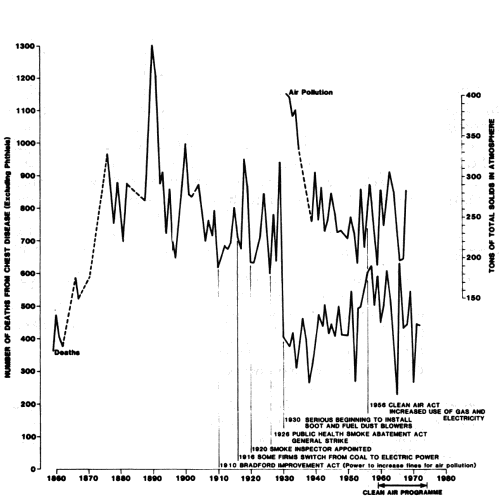 The peak in 1890 was due to an influenza epidemic. The diagram above traces the number of deaths from chest diseases and the changes in the level of air pollution. Unfortunately, records of the scientific measurement of atmospheric pollution in Bradford did not begin until 1930. As the diagram shows, there was a marked fall in mortality in the city after the 1926 coal strike, a period which was notable both for more effective national legislation to reduce atmospheric smoke and for a low level of industrial activity during the 1930s slump. It will be seen that this reduction in smoke was matched by a fall in the number of deaths from chest ailments, providing strong evidence to support the views of a succession of local medical officers that there was a causal link between air pollution and respiratory disorders. The seriousness of air pollution was recognized at the beginning of the 19th century, when Bradford had only a few coal-burning steam engines, although at that time there were other important sources of pollution in the form of foundries, and major ironworks at Bowling, Low Moor and Shelf, together with the outpourings of thousands of household fires. From a couple of steam-driven textile mills in the central townships in 1801, the number increased to 83 in 1841 and to 133 in 1871. The 1867 report of the Smoke Prevention Sub-Committee of Bradford Council listed 591 boilers burning 1200 tons of coal a day, and another 1300 tons as being consumed in other industrial establishments in the borough. These chimneys belched out large quantities of smoke, ash, sulphur and other irritants into the atmosphere of Bradford Dale. As the diagram shows, there was a rise in deaths from chest diseases between 1860 and 1880. Bradford's incorporation as a borough in 1847 provided an elected administration to regulate and manage the expanding town. Along with other health improvement regulations its byelaws covered smoke control, but records show that these byelaws were not enforced with sufficient strictness to reduce the smoke and the deaths which occurred through related chest diseases. That council members were aware of the problem is shown in the request of Councillor Bilton, who, in 1848, moved 'that the 65th byelaw dealing with the consumption of smoke, be carried into effect. '2 Titus Salt, a leading industrialist and Bradford's second mayor, had said in 1853 that it was not for him 'to do anything to pollute the air and water'. He had earlier fitted smoke-consuming apparatus into his Bradford factories but his pioneering example was not taken up by his fellow millowners. Detailed information on mortality from respiratory complaints other than phthisis is available in the Bradford Medical Officer's Reports from 1859 until the reorganization of local government in 1974. Deaths from these causes were at a rate of 3.50 per 1000 in 1859 and were still running at 4.30 per 1000 at the end of the century. The rates fell from 2.45 in 1900 to 1.37 in 1931, but rose slightly during the post-war trade boom and settled down to 1.52 per 1000 in 1971.5 By the end of the latter period a clean air programme had been implemented for the whole of the city. The Borough Medical Officer, Dr T.W. Hime, in his report of 1884, attributed the lack of effective remedial action to the widespread belief that because factories provided work, the employers should not be pressed too hard. He also remarked that the low fines which were being imposed by local justices did little to discourage law-breakers. Council committee minutes of the period reveal that Bradford's leading industrialists were frequent offenders, and some of them had been, or were, council members and J.P.s. In effect the councillors who formulated the byelaws, exercised responsibility for their enforcement and acted as judges when offenders were finally taken to court, were at times the very people who broke the law. Thus in 1875 eight of the thirteen members of the Smoke Prevention Subcommittee were in manufacturing, and one of the remaining five was a coal merchant. In that year Councillor Silas Scott was the Sub-committee's chairman and he also served as a borough magistrate. The Sub-committee's minutes frequently noted the delivery of abatement notices, delays by the mill owners in applying remedial measures, and the very lenient penalties awarded by the courts. Among the offenders so reported were such important representatives of Bradford's industrial establishment as S.C. Lister & Co., Edward Ripley & Son, T. Ambler & Sons, J. Priestman & Co., Smith Anderton & Sons, Samuel Smith & Co., and Bowling Iron Company. Senior members of some of these firms were on the Council, or, like H.W. Ripley, were borough justices. The Bowling Iron Company was a persistent offender. It was reported by John Pickles, the Smoke Nuisance Inspector in February 1868, but little had been done by the firm to meet the requirements of the byelaws by August, and the Council gave its approval to prosecute. It was later recorded that 'the experiment had failed', but the Company was given a further three months to deal with the nuisance. Still nothing happened. The story was repeated in subsequent years. However, on 12 December 1874 they were brought to court and fined a total of £5 with £9. 10s. costs for ten offences. S.C. Lister & Co. were also generously treated both by the Council in delaying action, and by the court in levying low fines, or imposing no penalties other than court cost.8 It should be emphasized that these two examples serve to show the generally sympathetic attitude of councillors and magistrates towards the business community in general on the question of smoke abatement. They should not be interpreted as marks of undue favouritism towards the distinguished associates of these civic officers. In effect, little, if anything, was done to deal with the pollution problem. The use of low-grade fuel during certain years made things worse. Thus in 1908 the M.O.H. complained that 'smudge' or 'small slack' produced large quantities of atmospheric grit, as well as black smoke.14 During that year there were 714 deaths from respiratory diseases other than phthisis, more than a quarter of which were children under five. The diagram shows a marked fall in air pollution from the late 1920s when the General Strike resulted in less coal being used. This was followed by the recession, a switch to cleaner coal and the installation of effective smoke-reducing equipment. As the graph shows, some industrial and commercial establishments had begun to use electricity. There were 1512 electric power users in 1915, and 1735 in 1916. The diagram shows a marked correlation between the reduction in air pollution (represented by the volume of air-borne solids in the main industrial centre of Bradford) and the considerable drop in the number of deaths due to chest diseases, from the peak of the 1890s, when there were 1318, to 993 in 1900 and 940 in 1929. However, the real attack on air pollution came with the Clean Air Programme, following the passage of the Clean Air Act 1956, although the Bradford Local Act 1949 empowered the Borough Council to create smokeless zones in which both domestic and industrial emissions could be controlled. New council housing estates dating from 1950 were covered by the smoke abatement policy. Local historians have concentrated a good deal on the improvement in water supply and sanitation, but air pollution has received less attention. Local politicians, with a few notable exceptions, gave a low priority to air pollution, as may be deduced from the behaviour of the council committees and local magistrates. For several years smoke prevention was treated as a residual function of the Hackney Carriage and Cleansing Committee. Even though conscientious officers were appointed to oversee the byelaws, and the city's Medical Officers of Health constantly demonstrated the connection between air pollution and chest complaints, there was a marked reluctance on the part of industrialists to co-operate, and on the part of the councillors to press matters too hard. Improvement had to await changes in technology, and an appreciation by the polluters that it was in their own interest to use fuel more efficiently. Local administrators, too, had to show a willingness to take action to eliminate smoke. Changes in the franchise helped to produce a generation of councillors and aldermen with different economic and social values from their 19th century predecessors. Armed with the powers of the Clean Air Act 1956, with a will to support their medical officer by taking appropriate action, they succeeded in the space of less than twenty years in cleaning up the city's notoriously dirty atmosphere and making Bradford a healthier place in which to live. 17. M.O.H. Report 1972, p.75, for air pollution. The figures are for the seven sampling stations in the city.